As the scant official prizes (10k$ for 1st; steak knives for 2nd) of the full Race to Alaska (R2AK) have now been claimed, it’s time to focus on the R2AK side bets: $1k for the 1st boat under 20′ to reach Ketchikan; and a Fisheries Supply gift certificate and loaner Seagull outboard for the 1st (most southerly, but still persisting) boat to get tapped out by the sweep boat. Two of these teams did not qualify for the full race. Both would likely have dramatically altered this R2AK. 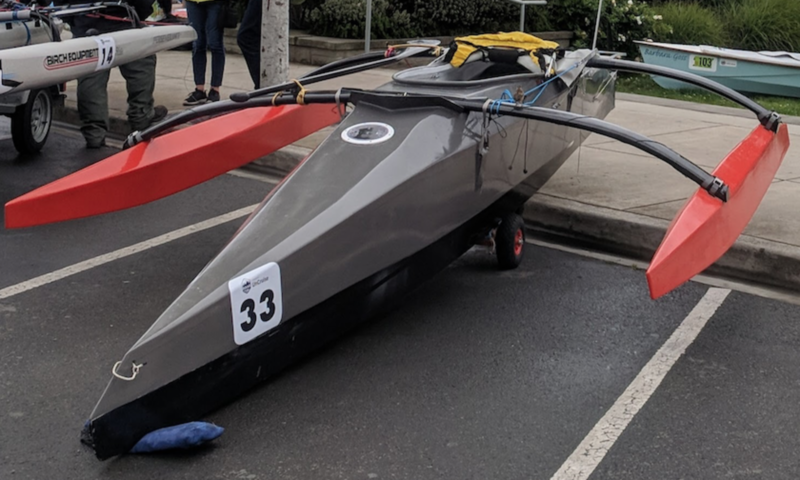 Truck-trailer problems prevented solo racer Roger Mann of Team Discovery from making it to Port Townsend with his custom trimaran. Roger was first to finish solo in the 2015 R2AK, having persevered over the 1200 km course in a Hobie Islander. This year he initially planned to paddle a folboat north without food (he planned to forage in the intertidal). Later he prepared a trimaran he’d built for other adventure races, like the Everglades Challenge. Matt Johnson of Team Take Me to the Volcano managed to get the only boat purpose-built for the 2016 R2AK finished in Seattle, pedal-sailed to Seattle, and started in the qualifier. Unfortunately, a fatigued aluminum bracket caused one of his amas to separate from its crossbeam shortly after he’d run into the Strait of Juan de Fuca. When he managed to pedal up wind and current round Point Wilson, Neptune dashed his hopes of continuing with a temporary lashing when both amas were ripped off by steep waves and a crossbeam was broken by the surf. Undeterred, Matt returned to Seattle to get his rowboat, drove to Port McNeill and embarked on a row back to Seattle — in part to learn more about the race course for his future bids to win! Of the remaining 14 teams that started the full R2AK from Victoria, three have withdrawn (as of July 1). Karl Kruger of Team Heart of Gold human-powered his SUP sans sail not only across the Strait of Juan de Fuca to complete the qualifier, but then as far north as False Narrows in the first couple days of the full race — keeping up towards the front of the fleet. Sadly, his SUP — more heavily loaded than in his previous experiences — caused him to paddle asymmetrically, resulting enough knee and hip pain that he was forced to retire. John Manning and his crew in Team Why Not made it into the central Gulf Islands in their 1960 Cal 20 before retiring. Mark Dussel of Team Gold Rush stopped after entering Haro Strait having decided his Trika 540 wasn’t up to the long haul north. Colin’s at Peel Island near Port Hardy. Thomas is at Helmcken Island. Dan is at Turn Island. Mathieu is at Chatham Point. And Tim is positioned to run checkpoint #1 just north of Campbell River.